The Magpies had made it into the grand final, joy! But the community had also planned for months the reopening of their Men’s Museum, restored to past glory after decades of obscurity and decline. 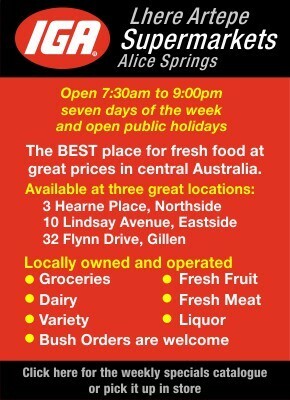 Visitors from all over Australia were coming. The event would have to go ahead, come what may. “Go the Magpies!” one man yelled. It might have been David Price, husband of MLA Bess Nungarrayi Price, Yuendumu born and bred. He was there, she’d stayed in town and gone to the match. There was laughter and clapping all round. Left: Joe Bird and Thomas Rice. No Warlpiri women had come to the museum. 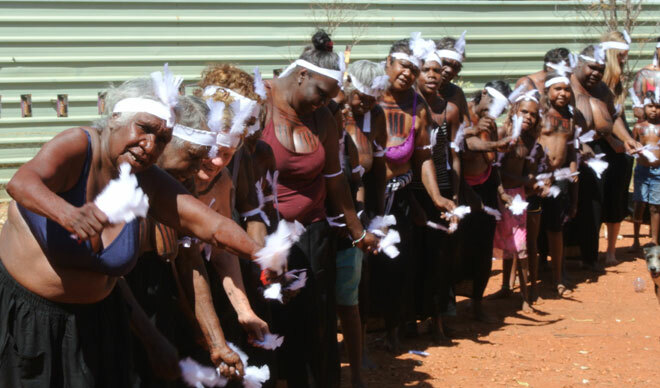 They had honoured the occasion, which also celebrated the thirtieth anniversary of Warlukurlangu Artists, with their Ngapa (Water Dreaming) dance back at the art centre (below). But a lot of non-Aboriginal women had made the journey especially, including notable figures from the Aboriginal art world. What Jakamarra encapsulated here Philip Jones later described as the Old Men’s “revolutionary idea” of bringing into the museum the rock paintings from sacred caves across their traditional lands. 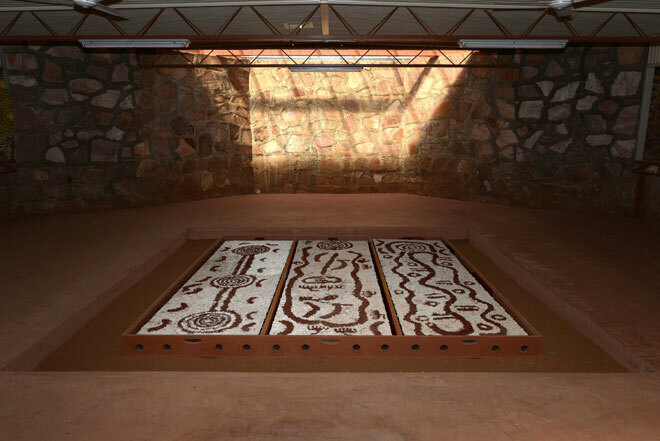 This decision as well as its glorious realisation are what make the museum a site of such significance, “unique” in Australia in the estimation of Jones, curator and historian with the South Australian Museum and author of a forthcoming book, Desert revelation: the Yuendumu Men’s Museum and its murals. But the question of access for more than half the people present was still hanging in the air. 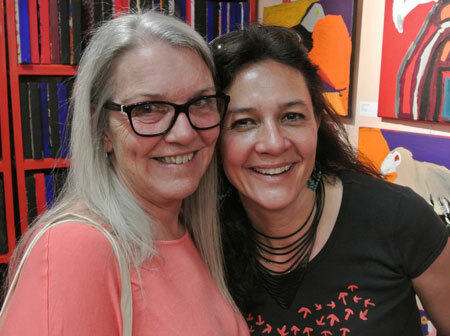 Cecilia Alfonso, the dynamic manager of Warlukurlangu Artists (at left with Susie Low, CEO of Warlpiri Youth Development AC), was taken aback, even if she didn’t show it when she got to her feet. She and assistant manager Gloria Morales have been integral to the restoration project, raising the funds and capably managing it, as they have done with other infrastructure projects in the community over the years. They engaged a woman as conservator, Catherine Millikan of the National Gallery of Victoria, to do the meticulous conservation work on the murals. So women not being allowed in was “news to me”, Alfonso good-humouredly told the crowd. But permission they had. From its inception the restoration had been the subject of “extensive community consultation with the men”, she said, and permission for women to have access was given before work proceeded. 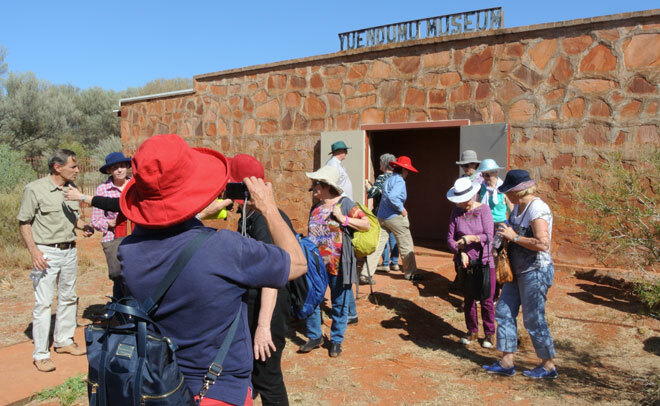 At the original official opening on 31 July, 1971, non-Aboriginal visitors including older women could enter on payment of a fee, fixed then at 30 cents. For the Old Men who instigated the museum, it always had a double role, that of a keeping place (with some contents excluded from public view) and a showing place, as reflected in that fee. Alfonso ended with an anecdote from the early days, about a visit to the museum by the mother of longtime resident of Dutch origin Frank Baarda, his mother given the okay by Old Men as she was an old white-haired woman coming from elsewhere. The mood remained upbeat. 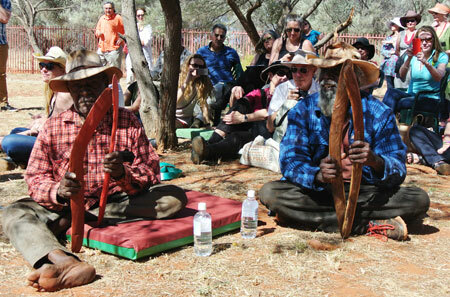 Visitors were going with the flow here on Warlpiri home ground. The art centre had printed a program for the day’s events, headed “Tentative”. The women’s dancing had been scheduled for 12.30, but took place closer to two. Right: Getting ready to dance, Tianna Ross, Chantelle Sims, Emmalisha Robertson. That’s the desert way. And it was worth the wait to see that long line of women and girls, painted up, wearing white headbands and a cluster of white feathers on their foreheads, the little girls so eagerly watching and imitating the older women, feet beating the ground to the rhythm of clapping sticks and song. Following Alfonso, it was the turn of Philip Jones to speak. It had been hoped his book would be launched at the opening, but as he has worked, more and more material has come to light. Research in the archives has now made clear that the idea to build the museum developed in the early 1960s. Till now it had been thought that the museum’s history was fairly brief, developing over three or four years prior to the official opening in 1971. In 1963 the superintendent at Yuendumu had control over people’s labour, he could direct what they worked on, explained Jones. When the Old Men came up with the idea for a museum, “to his credit” the superintendent allocated one day a week for work on it. Local men quarried the stone from nearby and by the end of ’63, perhaps into ’64 the walls had come up to five feet. The design for the building, developed by the Old Men, was “unique” – in Australia and in any museum, said Jones – “reflecting the knowledge and the culture of the people themselves”. Visitors to the museum would be privileged to go into this central area but not, at that time, into the wings on either side, where there were cupboards containing the sacred objects that the men had decided to keep secret and safe in the community. The wings and their contents related to the Warlpiri patrimoieties, four sub-sections (‘skin groups’) on one side, four on the other. Left: Part of one wing as it is today, showing a Snake Dreaming, with a painted termite mound in front. Photo by Greg Weight. Luckily the Old Men had backing, particularly from people like the Baptist missionary Tom Fleming and his wife Pat. They helped promote the idea with the Aboriginal Benefits Trust Fund in Darwin. Soon Warlpiri men were taking money out of their pay every week and putting it into a fund. Initially the idea was to save for a truck to take them out to the sites for which they were responsible. Then the idea turned to bringing in some of the objects kept in secret storage places and making them safe in the community. Similarly there was a realisation that the rock paintings themselves were deteriorating: Should they go out and repaint them or could they, in a sense, bring the rock paintings into the museum? “This was a revolutionary idea really and this is what happened”, making the museum something of a “compressed encyclopaedia of all the wonderful paintings that are still out there in the country”. One of the key figures behind the museum was “the grand old man”, Darby Jampijinpa Ross. He also became a foundation member of the Baptist church in Yuendumu, moving between the two worlds. 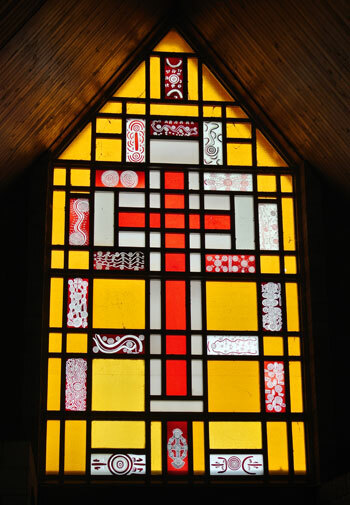 Jones said it was Jampijinpa who probably saw to it that Warlpiri kuruwarri designs were used in the stained glass window of that church (right). Some of these designs have appeared in other churches in other communities, but not at this high level of realisation. Under Jampijinpa’s leadership the museum became a really important place in the ’70s and early ’80s, but he was already 71 years old when it opened. 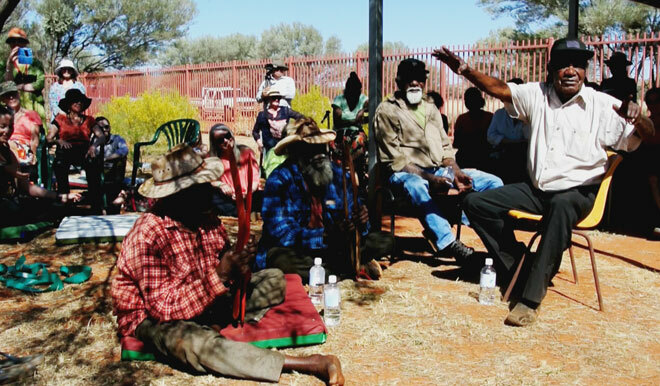 With the pressures the community was under, no-one came forward to take over as Jampijinpa grew older and more frail. The decline began. The objects were put away safely, but the museum structure was at risk. I think the spirit of the occasion was such that most women there shared that sentiment, even if they would have gone away a little disappointed. But the ground shifted. From left: Joe Bird, Thomas Rice, Robin Granites, Harry Nelson. The singing and clapping of boomerangs rose again. A couple of the men present came forward and danced briefly. It was a glimpse of ceremony whose lack on the day was so embarrassing for Jakamarra. Alfonso spoke to him quietly then and a few minutes later announced that everybody could go into the museum, except for children. “That’s what I call a last minute decision!” he exclaimed as the women visitors too made their way towards the museum. And the singing rose, more vigorously than ever. It was a sound to keep in mind inside, above the excited chat and a transistor broadcasting the footy score, the space aglow with colour, flickering with movement (photo above by Greg Weight). Ochres, reds, white, black, softened by age. Many large concentric circles, vigorously drawn, linking parallel lines, long sinuous ones, shifting fields of dots, many snakes, emu tracks, a multitude of detail – an outpouring to imagine coming with full-throated song. And by the way, the Magpies won. 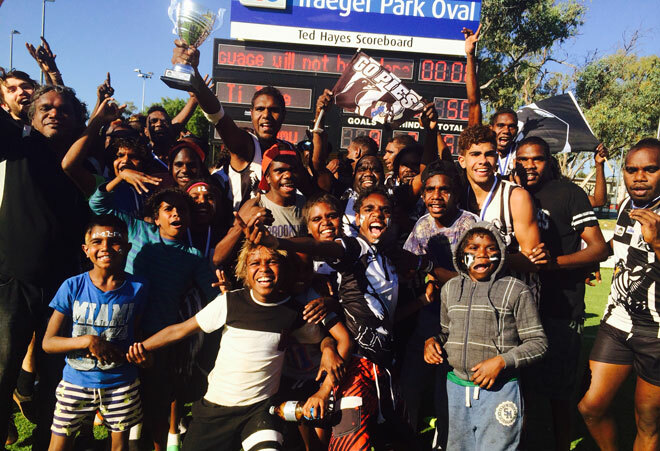 Magpies celebrating their 2015 victory, photograph courtesy MLA Bess Nungarrayi Price. *Behind the Doors, An Art History from Yuendumu, by Philip Jones with Warlukurlangu Artists. 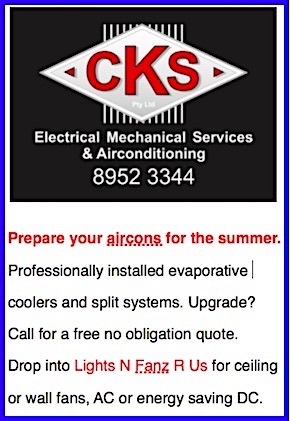 South Australian Museum and Wakefield Press, 2014. See page 60. RELATED READING: Yuendumu writes new chapter on the beginnings of contemporary Western Desert art. 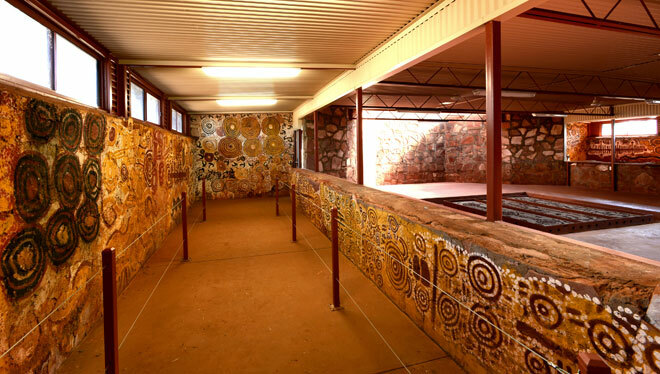 Photographs of the museum’s interior by Greg Weight, courtesy Warlukurlangu Artists. Other photographs (except for the Magpies) by Erwin Chlanda and Kieran Finnane. Yes it was me, I confess, Go the Magpies! I couldn’t help myself. My wife is known to some as “Aunty Magpie”. When several of the old ladies asked me “where’s Nungarrayi” I could answer, “in town looking after all those young fellas for you”. They were all impressed and happy with that reply. The winning of the grand final by Yuendumu was an extremely important, morale building event. 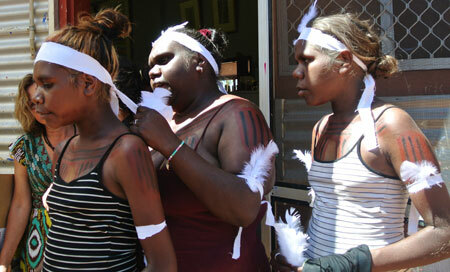 Warlpiri are proud of their heritage but also adapting to cope with new problems. My father in law was one of those inspired old men, like old Jampijinpa his cousin, who helped build and promote both the museum and the church. Like Jampijinpa, and several other men of his generation I knew, he was a philosopher. He knew the difference between the letter and the spirit of the Law. He knew about the need for wise adaptation not blind adherence to an ancestral law that faced problems not imagined when it was codified. Did you notice the stone in the walls of the museum is the same as the stone used to build the eastern wall of the Memorial Club? Warlpiri stone was used for that as well. My wife pointed this out to me years ago. It came from a quarry on her family’s land. Oh and somebody calling himself Matt told us in comments on a previous article that Yuendumu is on Anmatyerr not Warlpiri land. Land belongs to families rather then language groups traditionally although contemporary nationalists might argue otherwise, especially when they are embroiled in competition for royalty money connected to land ownership. The borders of language groups are often pretty fuzzy in the desert. I know individuals who speak both languages and are related to large extended families in both language groups. The last surviving member of my father in law’s family in his generation lived in Yuelamu much of her life and spoke both languages. Most of those I know who consider themselves, and are recognised by others, as the T/Os for Yuendumu call themselves Warlpiri but also acknowledge Anmatyerr speakers as close family. It’s not so simple Matt, leave it to the residents of Yeundumu to work that sort of thing out.